These task cards are a super engaging way to help your kiddos practice their subtraction skills, with and without regrouping! Use them as a station assignment, a "write the room" activity, or just as extra practice after other assignments are finished. 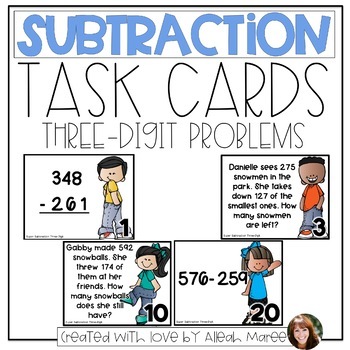 There are 24 regular three-digit subtraction equations, set up vertically and horizontally, as well as single-step word problems for your kiddos to work through included on these cards. 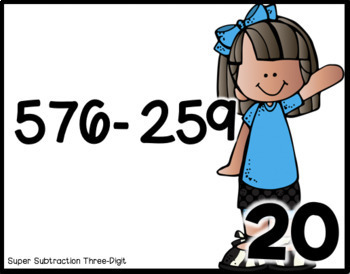 Your students will have the opportunity to practice finding important information and key words in the word problems, as well as simply solving subtraction problems. A recording sheet and answer key is included for the cards. Hope these help your kiddos master their word problem skills! :) Happy teaching!